Is it possible to get Windows Explorer to display thumb nail picture of an "afphoto" file? Can I export pictures in DNG? AFAIK Windows Explorer can't show up thumbs of ".afphoto" files since it has no corresponding Codec for this format. APh doesn't export or convert to other RAW formats like the open DNG. 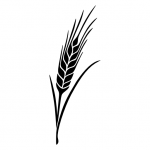 Try the FastPictureViewer Codec Pack, as discussed here. Right out of the box or with some third party tool? Windows Explorer without any codec installation. Ah fine so Affinity did it probably similar like on OSX and installs it's own thumbs preview on Win too. - Though I wonder then why so many people are asking for how to do this, if the functionality is already there? On the Mac versions, in Preferences > General there is a "Save thumbnails with documents" setting. I don't know if there is a similar item in the Windows versions, but if there is & it is not enabled maybe that would explain the difference? That could be a possible reason why some people do see thumbs on Win and some not. However I don't run the Affinity products on my Windows systems and though can't check for this. - Yes on OSX the QuickLook plugin component hooks this functionality into the OS. Without this setting, the Explorer thumbnails is not displayed. Yeah, Serif install their own codec when you install the software, so Windows File Explorer will show thumbnails for Affinity files without needing any additional third-party codecs. 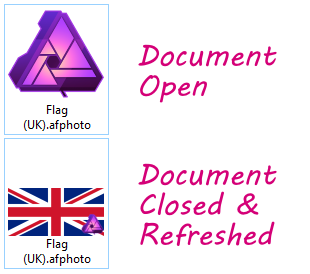 However, the issue people experience is possibly because Affinity Photo only shows the Affinity logo as the thumbnail until the document is closed. Once the document is closed though and File Explorer/Desktop is refreshed (F5), the thumbnail should be displayed instead of the Affinity icon. However, the issue people experience is possibly because Affinity Photo only shows the Affinity logo as the thumbnail until the document is closed. Once the document is closed though and File Explorer is refreshed, the thumbnail should be displayed instead of the Affinity icon. It seems that the explanation given by @Pšenda is the correct one -- until a file is saved there is no thumbnail to display, & unless the option to save one with the document is enabled there won't be one either. Serif install their own codec when you install the software, so Windows File Explorer will show thumbnails for Affinity files without needing any additional third-party codecs. 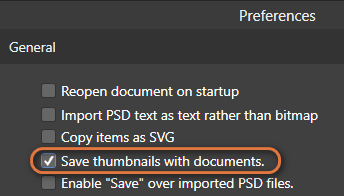 That would have been the question in turn then, since if they install their own codec with Windows too, if the prefs option "Save document with thumbnails" is relevant at all here? Meaning if their codec preview is dependent on an embedded thumbs pic or not. Though I think that one would be needed then in order to render a preview quickly here.